Roseblood is the first book I've read by author A.G. Howard, though I've had her Splintered series on my TBR for way too long. I was super excited when a copy of Roseblood showed up on my doorstep one afternoon, and I absolutely couldn't wait to get started on the story. That cover, it's almost too gorgeous to resist! I'm thrilled to have finally read something by A.G. Howard. The storyline for the book is based around The Phantom of the Opera, which I ashamedly know next to nothing about. (When I say next to nothing, I seriously mean next to nothing. Sigh.) This book definitely left me curious to know more about the original though, and one day I'll have to make sure to check it out. While the book is a modern retelling, it also has an interesting paranormal twist to it that I really didn't expect, but found rather interesting. I also liked that this was a standalone novel, and everything wrapped up rather nicely in the end. There are a lot of fascinating characters in the story, including the two main characters, Rune and Thorne, who both have had great sadness in their pasts. I was curious to discover how the bond between them came about, and why it was already so strong when they finally meet in person. It's a pretty interesting story! There were a lot of great secondary characters in the story as well, some I wish we could have read more about, like all of Rune's friends, for instance. They were seriously the best! 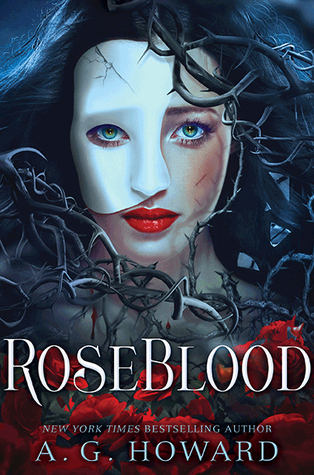 Overall; Roseblood was definitely an interesting story! And now that I've finally reading something by Howard, I'm totally curious to read more! I'm hoping to start the Splintered series, hopefully soon. Check these books out for yourself! Oooh nice! I so need to read this one! I don't know much about The Phantom... either but it still sounds like an amazing read! Nice review! I'm glad you liked this one. I've been dying to read this book ever since I heard about it, and don't worry I don't know anything about The Phantom of the Opera either so you're not alone. Her splintered series was really good, I've only read the first two books out of the three but I love it.